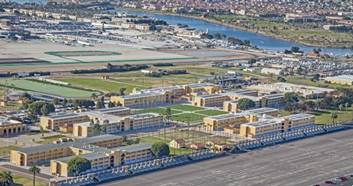 The Marine Corps Recruit Depot Barracks Complex was a design build project consisting of over 241,000-square-feet. Included in the project is a multi-structured barracks and Sports Medicine Reconditioning Therapy (S.M.A.R.T) clinic and two multilevel barracks buildings. S.M.A.R.T. was constructed as a two-story facility to allow for a more effective and efficient use of programmed space. It offers physical reconditioning, rehabilitation, strengthening, including cardiovascular training, therapy pool and whirlpools. Additionally, the two-story design maximized the natural light filtering into the facility through Solar Tube Skylights. All second floor Treatment Rooms and Offices were provided with interior windows to maximize views and visual control within the interior spaces. Motorized window systems were provided in the Cardiovascular Training/Weight Training room for high bay ventilation, which has a high ceiling and large volume space. Dynalectric was part of the design build team on this project. This method minimized risks to the owner and reduced the overall delivery schedule. The project included design and construction of two multistory barracks buildings providing relief to overcrowded existing facilities. Marine Corps Recruit Depot (MCRD), located in San Diego, California, trains enlisted recruits living west of the Mississippi River. It is also home to the Marine Corps’ Recruiter School and Western Recruiting Region’s Drill Instructors School.